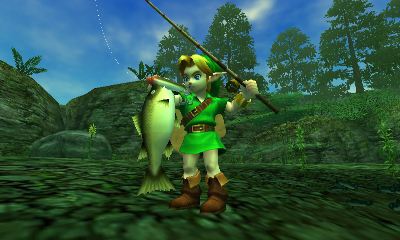 The Legend of Zelda: Ocarina of Time 3D takes the best-reviewed game of all-time for a brand-new experience. Now in 3D, all of the graphic textures and colors have been vastly improved, taking advantage of the considerable graphic power of the Nintendo 3DS system. 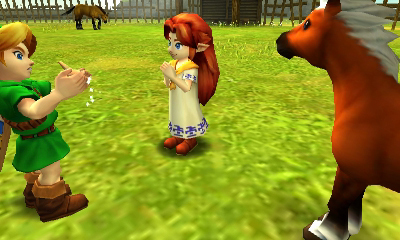 This game tells the epic story of Hyrule and Link, Zelda, and Ganondorf in remarkable depth and gives context to the many tales of their struggles. 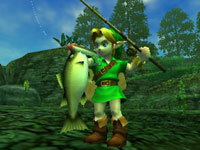 As such, this title represents a perfect entry point for players new to the Zelda franchise. 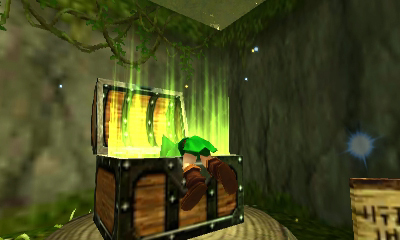 Return to Hyrule like never before. 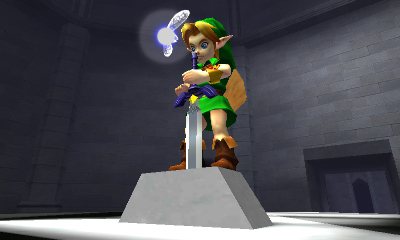 A favorite Zelda classic in 3D. 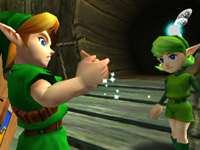 Beyond even the incredible 3D effect, every graphic texture and character model has been lovingly built from the ground up to create the most dynamic and vivid vision of Zelda's kingdom yet. This is Hyrule as you've always imagined it. 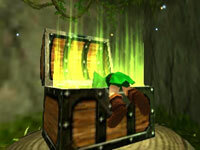 Link needs to play the eponymous Ocarina of Time many, many times over the course of the game. This involves a specific series of button presses to play one of the twelve songs in the game. 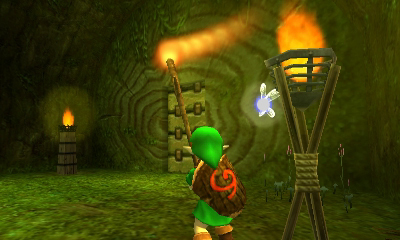 In the original title, you would need to assign the ocarina to an item slot, then likely review the button prompts to your song, then play them from memory. 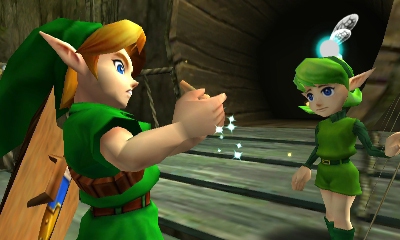 The Nintendo 3DS version has the ocarina constantly available on the Touch Screen, and playing with the button prompts for each song right in front of you. Touch-screen Accessibility - With a revamped interface designed to take advantage of the Nintendo 3DS system's dual screens, navigating menus and switching items is amazingly fast and intuitive. Motion Control - New feature for first-person mode is that, in addition to using the Circle Pad to look around, you can also physically move your Nintendo 3DS system around. This makes aiming much faster and more responsive, since adjustments are made as fast as you can move. 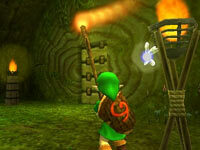 With Link, aiming your slingshot or bow is much faster and more accurate. Hint Movies - New to the game and great for new players will welcome the hint-movie system, which will give them a glimpse of the future and how they need to proceed in order to see all of the game's action and story. Boss Challenge - After beating each boss, you can relive that fight and try to improve your time. Once you defeat all eight bosses, you can choose to run a gauntlet of them all and try to survive. Master Quest - Once you've completed the game, you gain access to the Master Quest, a challenge for even the most dedicated player. The world has been mirror-flipped, and the dungeon puzzles are all different. Nintendo 3DS is a groundbreaking hardware release that brings 3D gaming to the handheld market for the first time. The fourth major release in the DS product line, the Nintendo 3DS utilizes 3D Slider functionality and an improved top LCD display to present a glasses-free 3D effect in compatible games, while giving players the option to moderate the effect as they see fit. Taken together with additional features including full analog control in 3D game environments, motion and gyro sensors that transfer the movements of the handheld into the game, 3D camera functionality, an adjustable stylus and full backwards compatibility to all Nintendo DS games and you have not only a must-have system, but a revolution in handheld gaming. Original game + a master quest. Equip Link easily with a stylus.